Principles of Animal Physiology, Second Edition continues to set a new standard for animal physiology textbooks with its focus on animal diversity, its modern approach and clear foundation in molecular and cell biology, its concrete examples throughout, and its fully integrated coverage of the endocrine system. Carefully designed, full-color artwork guides students through complex systems and processes while in-text pedagogical tools help them learn and remember the material. The book includes the most up-to-date research on animal genetics and genomics, methods and models, and offers a diverse range of vertebrate and invertebrate examples, with a student-friendly writing style that is consistently clear and engaging. Christopher Moyes and Patricia Schulte present animal physiology in a current, balanced, and accessible way that emphasizes the integration of physiological systems, an overarching evolutionary theme, and thorough coverage of the cellular and molecular basis of animal physiology. 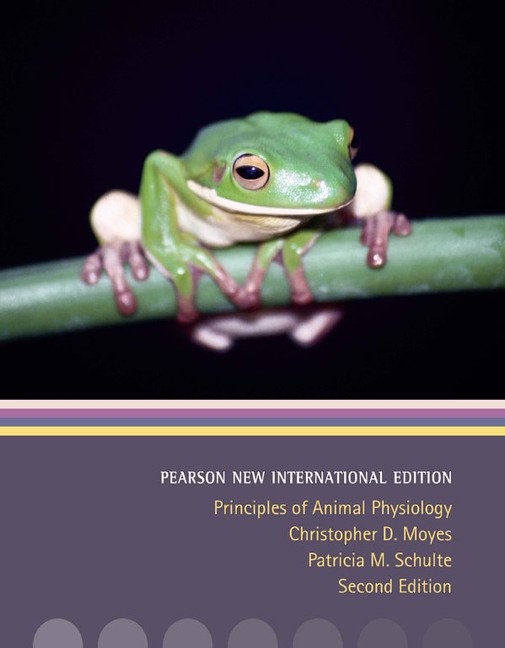 Principles of Animal Physiology comes with a comprehensive supplements package for students and instructors that includes a new Media Manager CD-ROM, a new Print and Computerized Test Bank, and a powerful Companion Website. The InterActive Physiology® 10-System Suite CD-ROM and PhysioEx™ V7.0 laboratory simulations can be packaged with the text at a discounted price. Evolution and Diversity boxes link chapter content to the overarching theme of evolution. Several chapter-opening essays provide additional evolutionary context. Unique animal examples are drawn from both vertebrates and invertebrates for a varied representation of organisms. Consistent attention to evolution emphasizes the importance of this process. The integrative nature of animal physiology is shown through the integration of all levels of biological organization from molecules to cells to organisms. Integrating Systems special sections at the end of each chapter in Part II describe how functions of specific physiological systems interact with other systems to meet environmental challenges. Genetics and Genomics boxes examine the latest genetic research, especially as it relates to the evolution of animal physiological systems. Mathematical Underpinnings boxes allow students to read about the physics and mathematics underlying physiology without losing the thread of the narrative or getting bogged down in equations and quantitative material. The endocrine system is discussed in relation to each organ system in the Part II chapters to show its integrated role in regulating each organ system. The dynamic nature of animal physiology is highlighted to show students that physiology is a dynamic and growing research area, and has medical, agricultural, or environmental applications. Methods and Model Systems boxes discuss experimentation and the use of model systems in animal physiology. Applications boxes show students how animal physiology is relevant to a variety of fields. Thorough, up-to-date coverage of the cellular and molecular basis of physiology provides a solid introduction to recent research developments. Promoting effective learning is a key goal of the text, with several methods to help students get the most out of the course. NEW! Concept Check Questions appear throughout each chapter. Answers can be found on the text’s Companion Website. End-of-chapter Review, Synthesis, and Quantitative (NEW!) Questions provide increasingly sophisticated and challenging ways for students to test their comprehension of important concepts. Answers can be found on the text’s Companion Website. Overview figures begin each chapter, helping encapsulate the key concepts of the chapter and providing a guide for review and self-study. Sentence-format headings enhance student comprehension and allow for efficient review. Clear and engaging writing style captures students’ attention and makes complex physiological concepts and processes easy to understand. Self-contained chapter reviewing chemistry, biochemistry, and cell physiology can be assigned or covered in class to address the needs of students with varying levels of science background. Superior, innovative art program facilitates learning by guiding students through complex physiological systems and functions. Anatomical art is used extensively to improve understanding of physiological processes in context. Flowcharts help students understand the dynamic and multilayered nature of physiological processes. “Stepped” art figures break complex processes into steps for greater comprehension.